One of my tips on going plant-based or vegan is to come up with a “short list” of easy, go to vegan meals that you know you love. When you have a list of about 5 or so meals that you can easily whip up, this will make your vegan journey so much easier. If you are accustomed to eating meat and other animal products, it can be daunting to change your habits and patterns. You might already have a list of meals that you like to eat/make on a regular basis, so you just have to replace those meals with plant-based ones. It might take some time to get used to but after a while, it’ll be come second nature to you, just like it has for me. 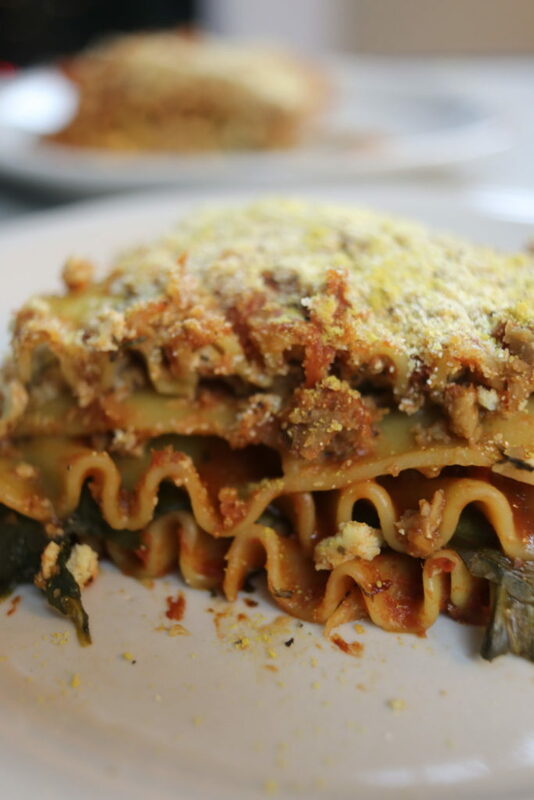 I love whipping up some vegan lasagna especially if I’m cooking for others. I’ve fed vegan lasagna to a number of non-vegans who all seemed to really enjoy it -especially the tofu ricotta! 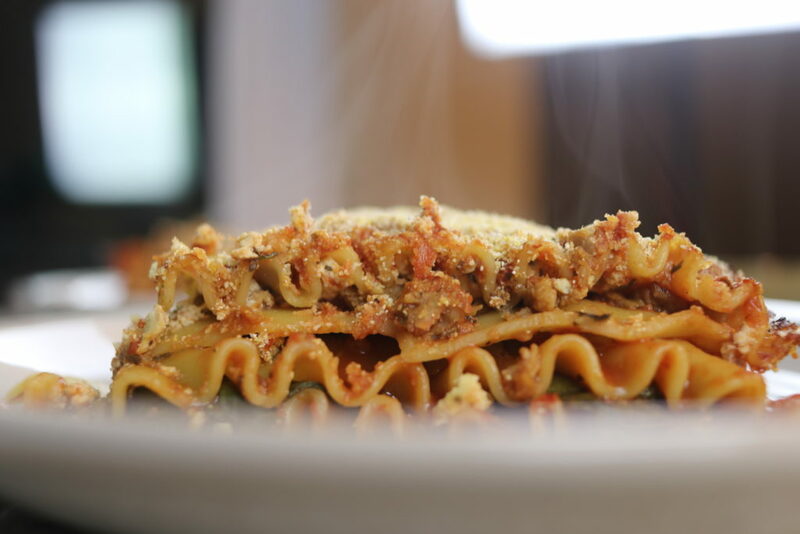 I’ve made vegan lasagna in many ways and this one is my “lazy” method that takes much less effort than some other ways of making it. To make the tofu cheese, add all the ingredients into a food processor and blend it until the consistency is very smooth, similar to cream cheese. 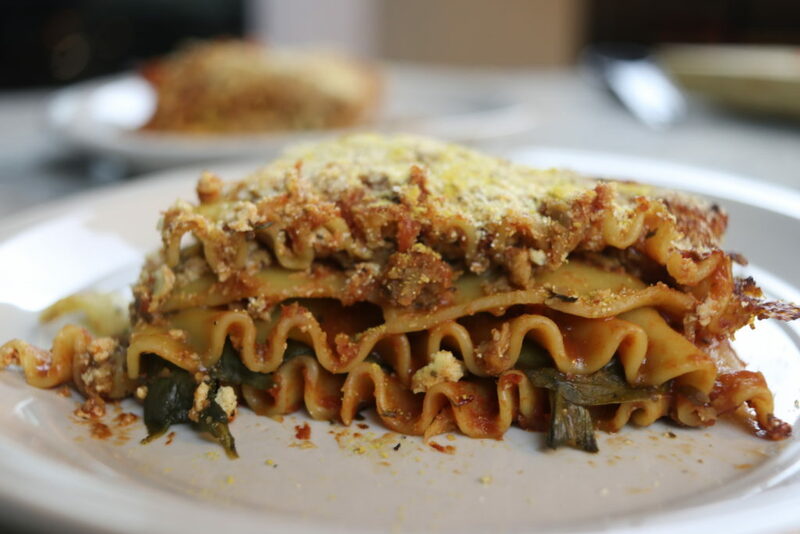 In a baking dish, spread a layer of pasta sauce on the bottom and place lasagna noodles side by side. Depending on the type of noodles you have, you might have to cook them first. Spread a layer of tofu cheese on top of the layer of noodles then place some spinach over that. Continue with another layer of noodles then add some veggie crumble and spread it on top. Add another layer of sauce then place more more noodles on top. Finish it off with one last layer of pasta sauce and make sure all of the noodles are covered. Cover the baking dish with aluminum foil and place it in the oven for 30 minutes. Remove the aluminum foil and bake for an additional 10-15 minutes. Sometimes, if I have extra rice left over and I also have some random veggies in the fridge, I like to make some simple sushi rolls. It seems difficult but if you already have these ingredients on hand, it’s actually quite simple. 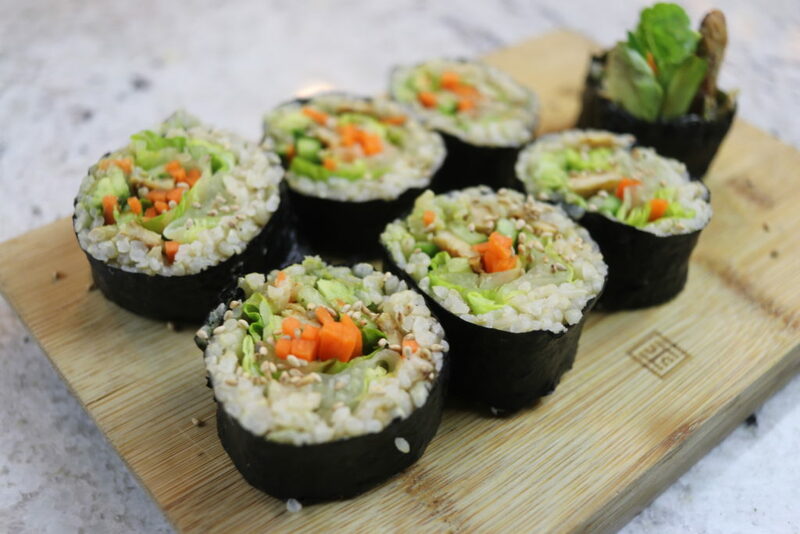 You could also make vegan KIMBAP, which are Korean style seaweed rice wraps. There are a few differences between kimbap & sushi and the main difference (as I see it) is that the rice is marinated differently. 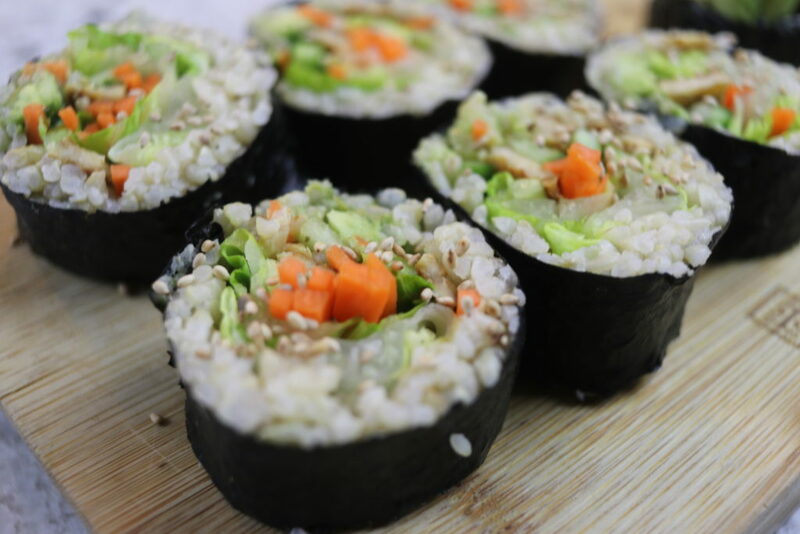 With kimbap, the rice is seasoned with just a little salt and toasted sesame oil mixed in. I sometimes make kimbap and I sometimes make sushi, depending on my preference that day! Since I used plain tempeh, I marinated it with some store-bought teriyaki sauce the night before in the fridge. You can also buy flavoured-tempeh so you can skip this step. Heat up a pan with some oil and fry the tempeh for a few minutes on each side, until they’re browned. Cut length wise into thin strips. Prepare all your veggies into long, thin strips. In a bowl, mix the rice with the rice vinegar and sugar. On a flat surface, place a nori sheet and spread the rice evenly and flatten it out. Leave a little bit of space (just under an inch) on one side of the nori to bind the roll later. 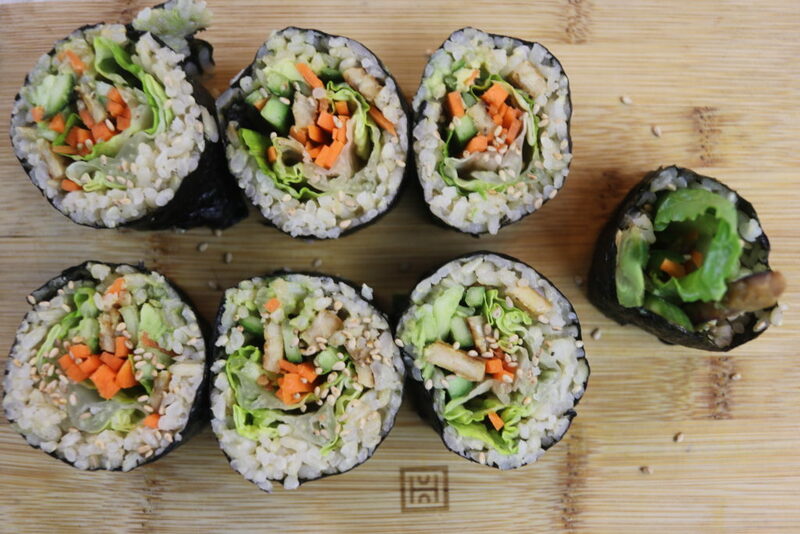 Now add your veggies and tempeh in a line along the middle then roll it up! Use some water to wet the space on the nori you left so that it will stick to the other side. Use a sharp knife to carefully cut the roll into bite sized pieces. I like to wet the knife with a little water after each cut to make it easier. I know, kind of basic. 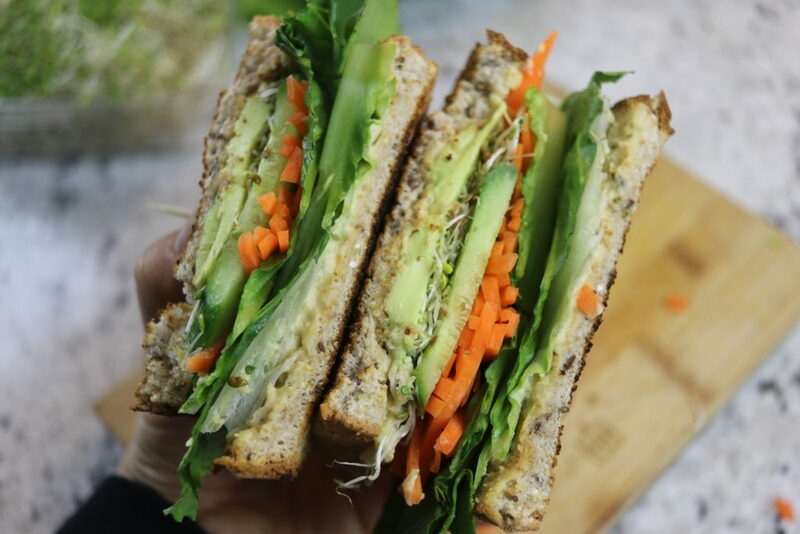 But who doesn’t love a good hummus & veggie sandwich! You could also make this into a nice wrap (I usually prefer a wrap, but I tend to have bread in my house more often than wraps). 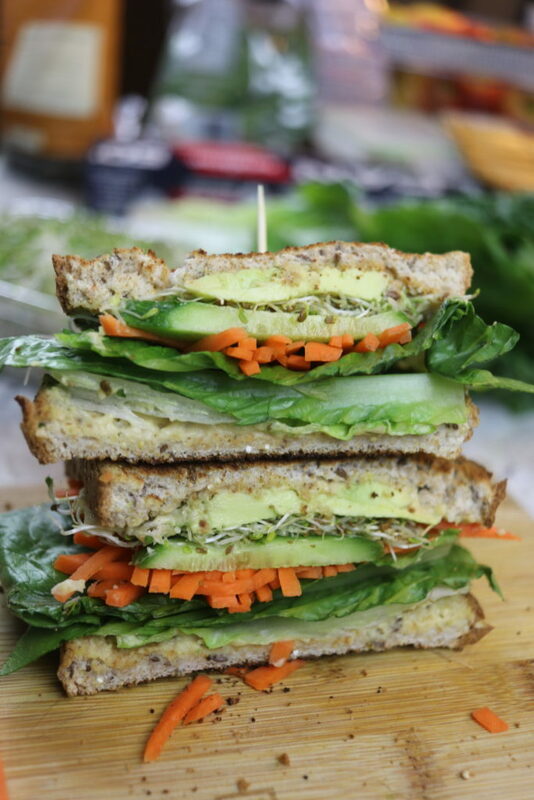 You can add lots of veggies into your sandwich and take a nice aesthetic photo while you’re at it ! Toast some sandwich bread in a toaster (optional). Spread a layer of hummus on both pieces of bread. 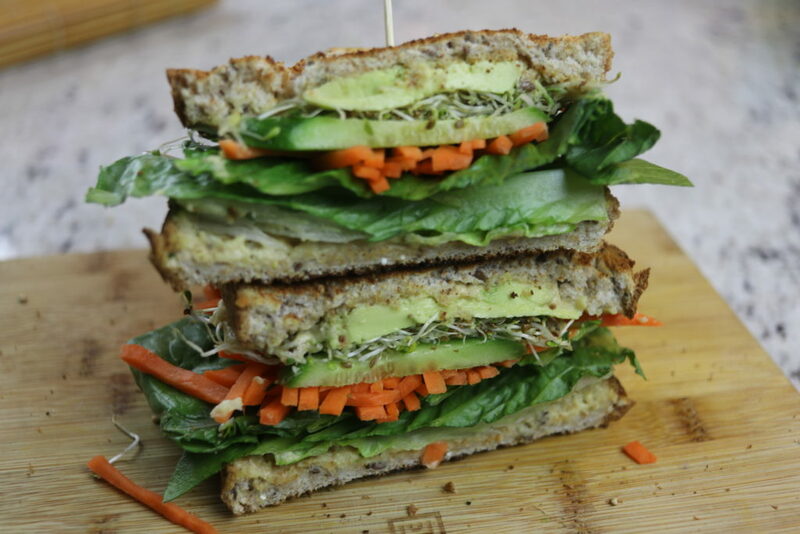 Chop all your veggies into thin slices and place them on the bread to construct your sandwich. Done! I love tofu!!! I have tofu almost everyday – it’s seriously my favourite vegan protein. 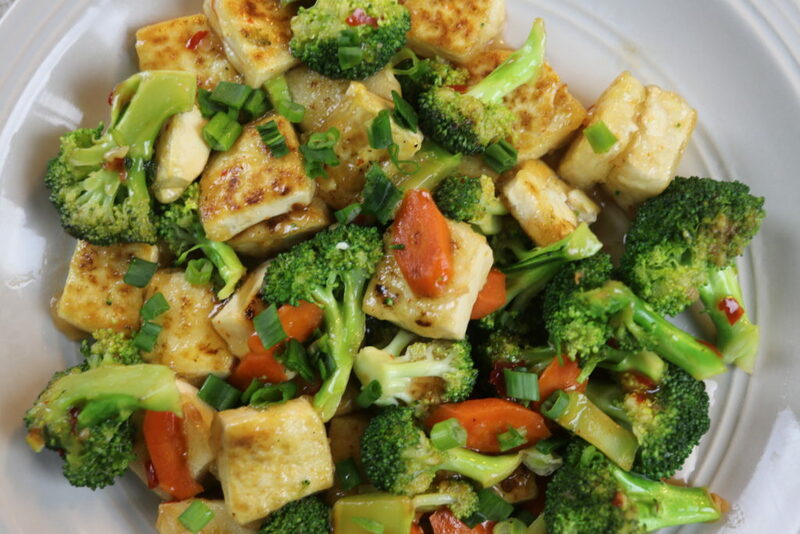 There are so many things you could do with tofu, this is just one way that I think could be delicious for everyone. Eat this with a bowl of rice and you are golden! Note: if you are lazy, you don’t have to coat the tofu with corn starch! You could just pan-fry the tofu on each side until golden brown – the coating is unnecessary but it will create a soft inside and a crispy outside situation 🙂 Usually, I’m too lazy though, let’s be real~! 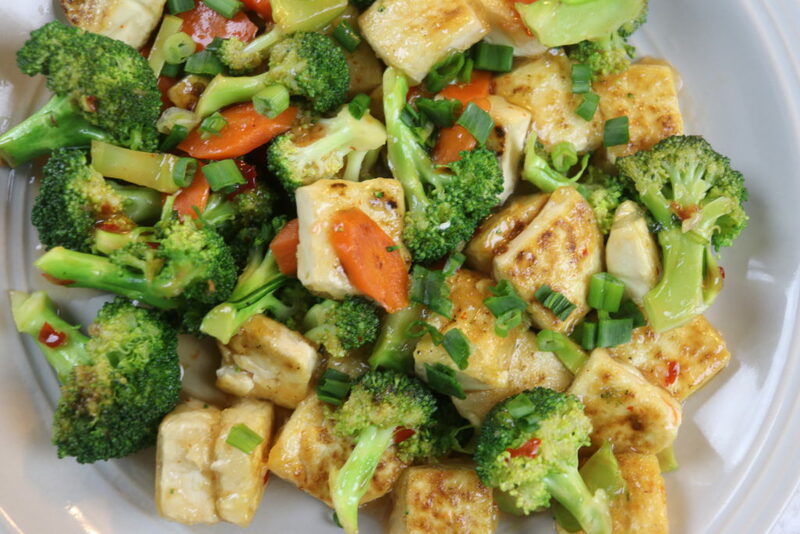 Use a paper towel to wipe off the excess water on the tofu and cut them into bite-sized cubes. Place some potato starch on a plate and coat the tofu lightly on all sides. 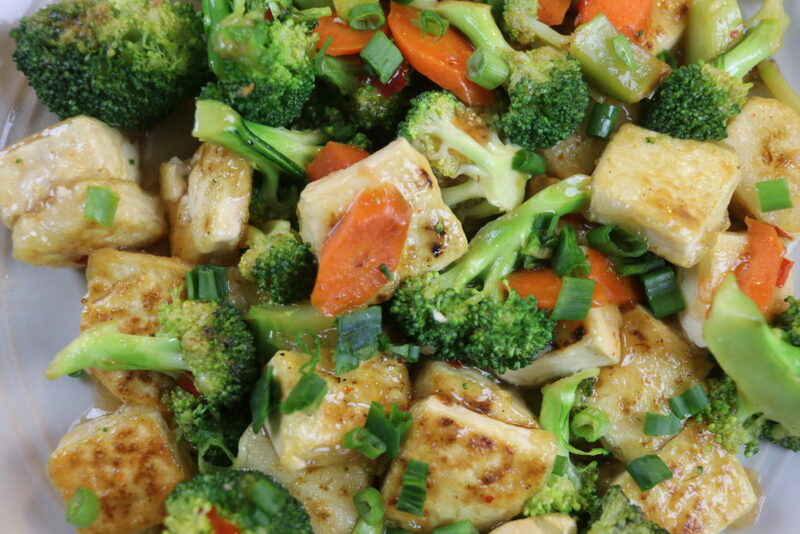 This step is optional if you want to make the outside of your tofu more crispy and inside soft. Heat a non-stick pan and add some oil. Add the tofu and try to make sure none of the pieces are touching as the starch likes to stick them together. Cook them on medium-high for about 2-3 minutes on each side until they are golden and crispy then remove them from the pan and set aside. Place the veggies in the pan and cook them for a few minutes. Add a bit of water to cook them thoroughly. Place the tofu back into the pan and add some sweet chili sauce (I thinned mine out with some water because it was too thick) and mix everything together. Garnish with chopped green onions and serve with rice!